Bruno is ready for his walk! Send me your photos for spotlight week! ​Miniature Schnauzer Puppies for sale in GA. We are a local breeder of Miniature Schnauzer puppies . 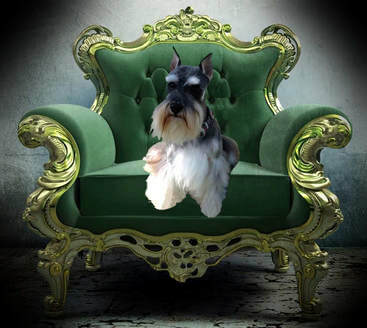 We Love miniature schnauzers and want to share this breed's intelligence, magnificent personalities, kind natures and Non-Shedding coats with others. All of our AKC Registered babies are very well socialized, played with daily, UTD on wormings, 1st puppy shot, tails docked, dewclaws removed, vet exam, health guarantee and sent home with a puppy pack. We will consider selling a puppy with full breeding rights to a responsible AKC Breeder. You will need to contact us to discuss the possibility and additional fee. We DO NOT sell puppies to breeding mills, Pet Shops or Pet Dealers, so please do not inquire. We breed for Quality. We do not keep a waiting list, so please check back often. Our puppies are generally adopted quickly on a first come first serve bases. Please see our Available Puppies to pick out your new Best Friend. We are an AKC Bred with H.E.A.R.T. Breeder and an Inspected and Licensed facility through the GA Dept. of Agriculture. Kennel inspection 12/7/2018. License No. 36111852. We are a legitimate LLC through the Secretary of State (GA). We welcome you to our facility to view our puppies (after puppies are 3 weeks old) prior to placing a deposit. All pictures on this website are used with permission of the owners who have submitted the photos for use by SchnauzersGA on this website.